I have been busy working on my black, white and red quilt top. The pattern is Chopsticks by Jaybird Quilts. This is an easy pattern because each 12″ triangle only take three seams. Here are the blocks that I have made so far. 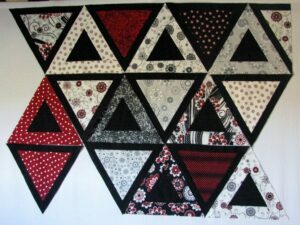 The directions tell you to make 40 triangles, then trim the sides to make the quilt a rectangle. I decided to make 10 half triangles which was no problem with the markings on the Creative Grid 60 degree ruler. I have already started auditioning quilting designs and would like to have this be a completed quilt by the end of the year.